Adrienne Nickles at work on the new Old German patio. Located in the lower level of Grizzly Peak in Ann Arbor, this additional seating gives patrons of Old German a chance to enjoy the outdoors for the first time. 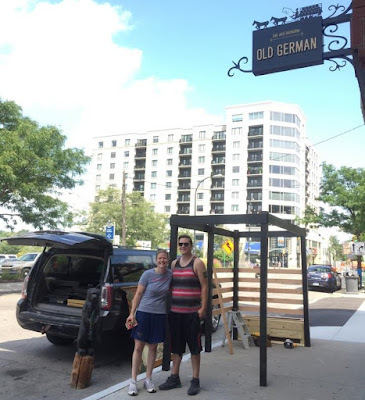 Old German’s new patio features furniture crafted by local woodworker Adrienne Nickles, the owner and artist behind Michigan Reconstructed, the patio is being constructed along the sidewalk of S. Ashley Street between W. Huron and W. Washington streets. Working along with Janelle Sterling and Kate Peterson to bring the designs to life, Nickles is building several different styles of seating and tables for the patio, as well as with trellises to support hops plants, which lend themselves to the beer-inspired theme. Owners of the Old German and Grizzly Peak Brewing Company, Jon Carlson, Greg Lobdell and Chet Czaplicka, shared a vision to give Old German patrons an outdoor space that is both modern and rustic. Once open, visitors can enjoy the fresh air and kick back with one of the Old German’s award-winning craft beers. The owners are avid supporters of the local area and took an interest in Nickles’ dedication to quality craftsmanship, artistry, and sustainability. Nickles’ woodshop is located in downtown Ann Arbor, just a couple blocks from the Old German. "When I was designing the patio space, I thought, 'Where would I want to go with my friends? Where would I want to take my family?'" Nickles said. "That was the inspiration." The woodwork on the patio will be constructed primarily from oak lumber, reclaimed from the Ann Arbor area. "My passion is using re-purposed materials to make something beautiful. Most of the material for this project is urban wood, and any other material will be coming from local businesses," said Nickles. "Jon and Greg are so cool about contributing to sustainability." An important aspect of the business overall, this new addition is expected to add to the overall aesthetic of Old German, as well as its upstairs neighbor, Grizzly Peak Brewing Company.